Peppers are warm-season vegetables. They dislike extreme fluctuations in temperature and will respond by dropping leaves, blossoms and even fruit. A plant without leaves can't collect or process adequate nutrients to support fruit growth. But if the weather isn't your problem, and you notice other signs, such as spots on the leaves or fruit, your peppers maybe suffering from a bacterial infection. Yellow leaves may also be a sign of fungal disease. If taking some corrective steps doesn't work, it's probably wise to just start over. 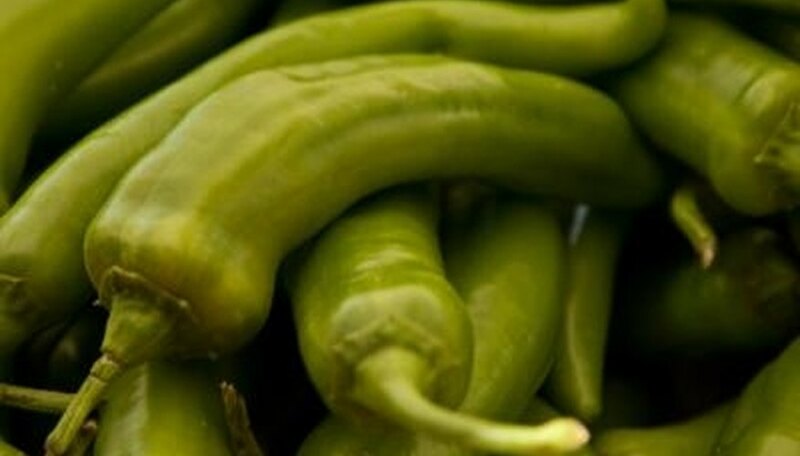 Plant peppers later in the season when daily temperatures are warm and night temperatures are about 60 to 65 degrees Fahrenheit. The soil should not be cool or damp. Black plastic mulch will help the soil retain heat if you're concerned that temperatures haven't quite reached the point where they're steady yet. Raised beds are another way to ensure warm soil for pepper culture. Plant pepper transplants in full sun. This will result in faster growing plants and warmer soil. Peppers love sun, but if your area is very hot and the peppers get no relief from the hottest afternoon sun, the fruit may get sunburned. This is called sunscald, so if you start to notice brown burn spots on the skin of the pepper, provide some dappled afternoon shade. Fungal diseases are common in peppers. Infected pepper leaves turn yellow then fall from the plant. Scientists have developed resistant varieties that can fend off fungal infections and it's best to plant resistant varieties if you're going to take the risk of growing peppers. Give each plant plenty of space -- proper air circulation is necessary for prevention of fungal diseases. If your plants have a fungal infection, practice crop rotation for the following years to prevent further infection. Bacterial leaf spot is a common cause of leaf drop in pepper plants. The disease begins as small spots on the leaves that appear to be water soaked but that gradually develop into larger, misshapen brown spots. Fully infected leaves will turn yellow and drop off the plant. Infested seed is the leading cause of bacterial leaf spot and seeds should be treated in hot water before planting. The best way to do this is to submerge the seeds in 122 degree Fahrenheit water for 25 minutes. If peppers lose lots of their leaves, the best response may be to simply throw out those plants and plant new ones, according to the North Dakota State University Extension. It's unlikely that the peppers will regrow their leaves, and pepper transplants are abundant and affordable. Remember to rotate crops the next time around. Cornell University Department of Plant Pathology; Managing Bacterial Leaf Spot in Pepper; Margaret Tuttle McGrath, et al.